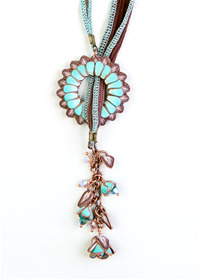 Handcrafted Jewelry created with Polymer Clay, antique copper filigree, hand dyed silk cords, and Swarovski crystals featuring lariat necklaces, pendants, bracelets and earrings. Art jewelry carefully hand crafted one petal at a time! 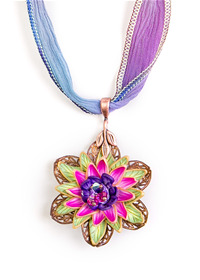 You have never seen polymer clay jewelry like this before! 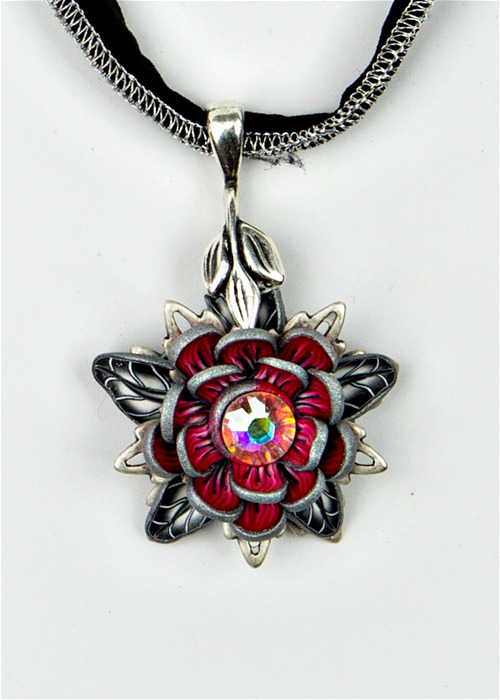 Receive free shipping for all orders placed in February, and get a free mini pendant with your purchase! 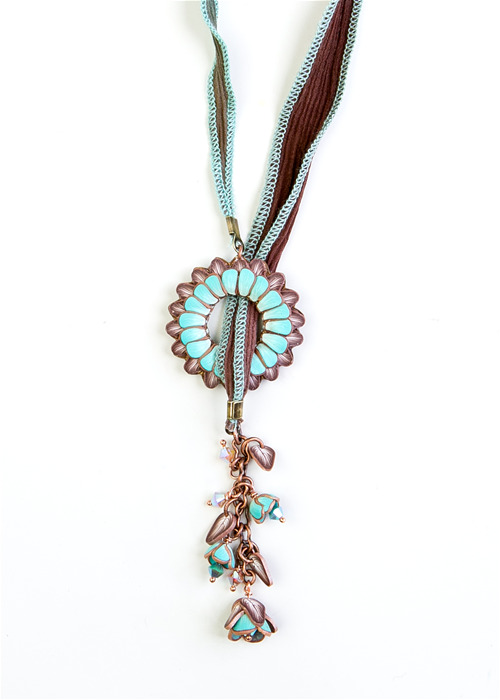 Flowers are blooming with this bright and beautiful floral lariat. 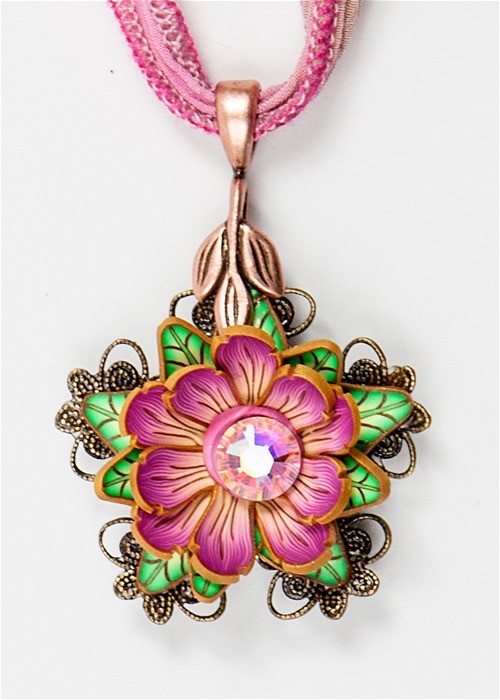 Polymer Clay sculpted on both sides of an antique filigree create the donut, while mini flowers, petals and leaves with crystals are attached to the end of a hand dyed silk cord to loop around your neck. 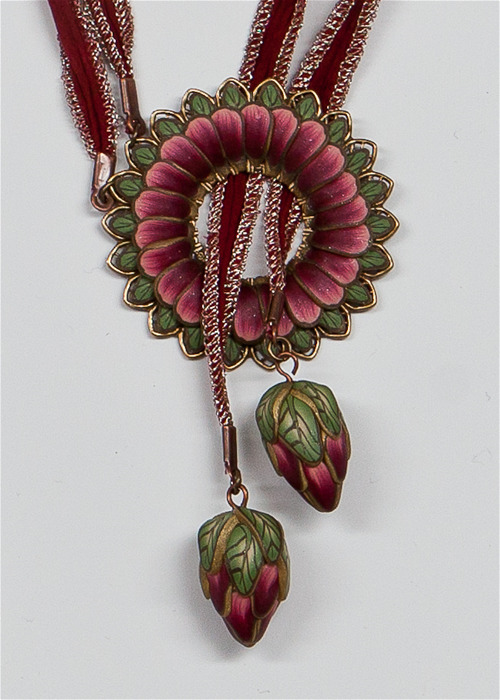 This unique design can be worn wrapped several ways and with many different necklines. 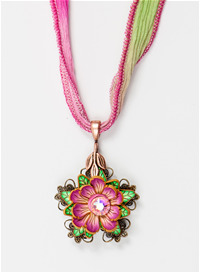 Flowers are blooming with this bright and beautiful floral lariat. 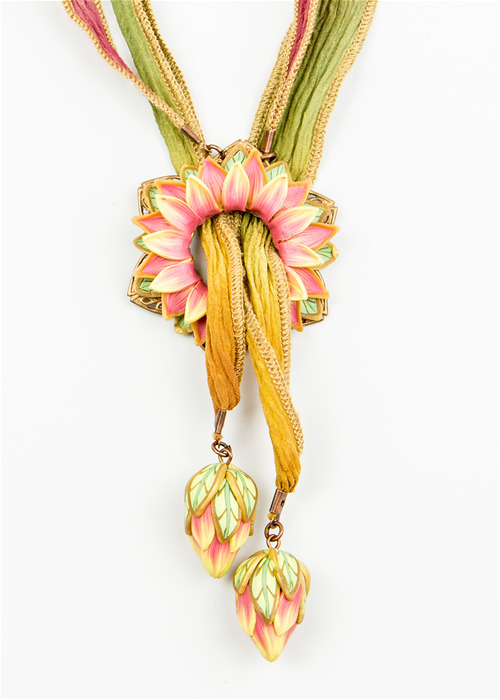 Polymer Clay sculpted on antique filigree create the donut, while two coordinating hand sculpted pods are attached to the ends of hand dyed silk cords to loop around your neck. 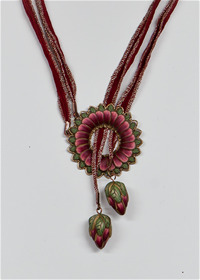 This unique design can be worn wrapped several ways and with many different necklines. 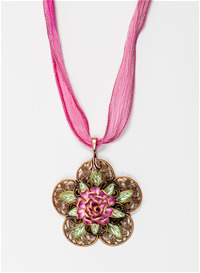 Handcrafted polymer clay floral pendant. Petals and leaves created using the millefiori method of caning. Cane slices sculpted delicately to form flower on antique filigree. Each flower accented with Swarovski crystals and pendants hang gently with a coordinating hand dyed silk cord. 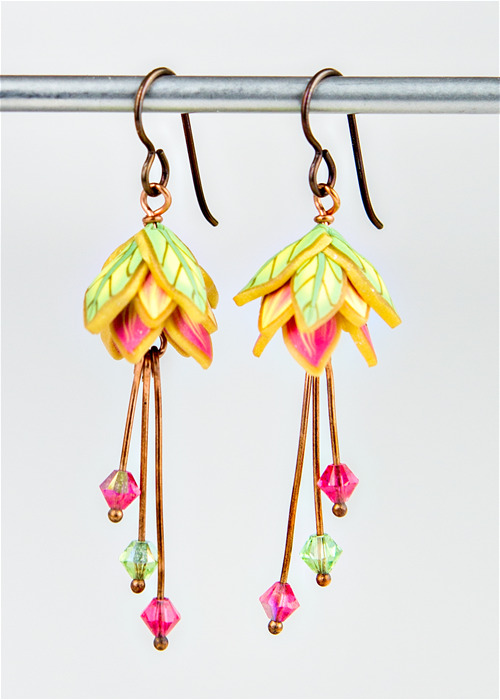 Handmade polymer clay fairy petal earrings. Petals and leaves created using the millefiori method of caning. Cane slices sculpted delicately to form floral bead. 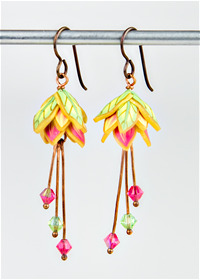 Swarovski crystals dangle from the flower adding a fairy-like quality to these lightweight earrings. Hypoallergenic Niobium ear wires add a warm, comfortable finish. 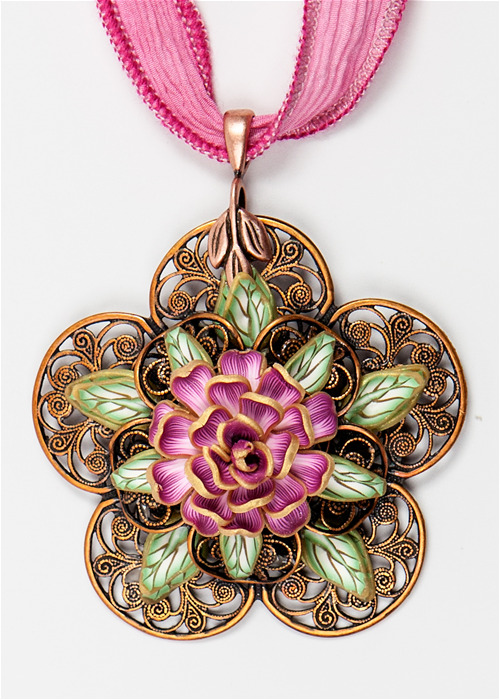 Handcrafted polymer clay floral pendant. Petals and leaves created using the millefiori method of caning. Cane slices sculpted delicately to form flower on antique silver filigree. 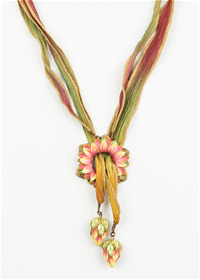 Each flower accented with Swarovski crystals and pendants hang gently with a coordinating hand dyed silk cord.